Well my earlier post about Akihabara returning to semi-normality may have been a bit premature. I’m sure you have by now heard the news about Asuka “Wide-Open” Sawamoto being arrested for her… colorful displays of the female body. This past Sunday brought on even more unusual events. 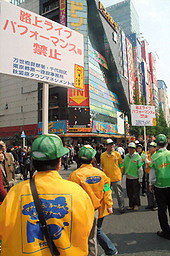 Volunteer groups and residents took to the streets to deter people like Sawamoto and other attention grabbing performances. The protests seems to have work, and Akihabara saw less performers and maids that it had seen in awhile. Is this the beginning of the end of Akihabara as we know it? Asahi via FG.